In an increasingly competitive market, retailers are always looking for ways to make their store look and feel better and for ways to offer their customers added benefits. 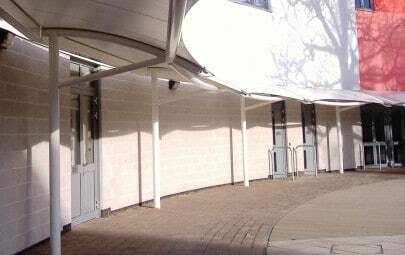 With this in mind, when refurbishing their store in High Wycombe, JR Sainsburys were keen to include a tensile fabric entrance canopy to add interest to the plain faade and provide shelter from the rain and sun for shoppers. 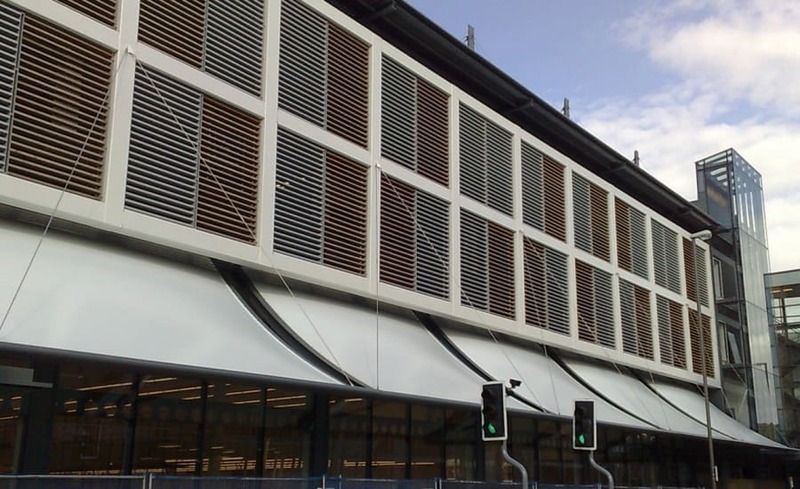 Working with architects Chetwood Associates, they approached Architen Landrell and as there has been a long standing history between the two companies – Architen Landrell has worked on several Sainsburys stores across the years they were the natural choice! 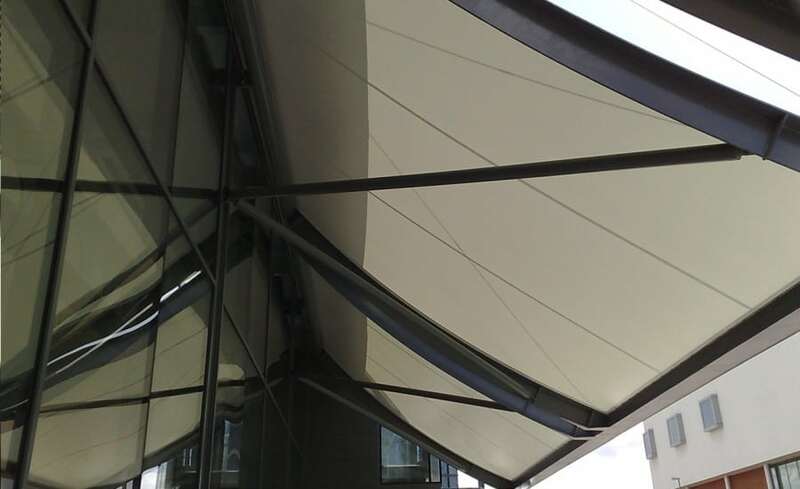 Working alongside the architect and contractor, our tensile fabric design and engineering team set about designing a canopy utilising from a series of cantilevered supporting steel arms, terminating with an aerofoil shaped gutter beam at the lowest point. 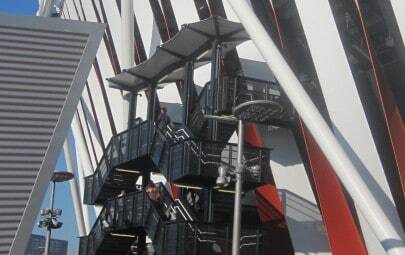 The entire structure was self supporting attached to steel brackets fitted behind the cladding from which the fabric was held and tensioned into the steel frames using aluminium shotgun extrusion. 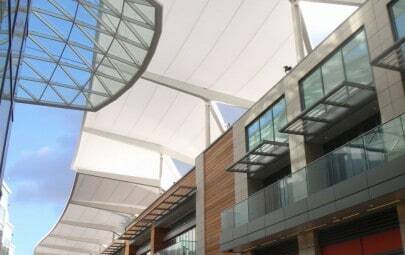 In order to provide an economical solution, but still giving a visually impressive result, the canopies were manufactured from PVC coated polyester. Installation took place within a narrow boarded pavement, at the storefront, located on High Wycombes busy Oxford Road. This meant that plant and equipment usage was extremely limited and the steelwork had to be hoisted up manually, within inches of the fully glazed store frontage, using chain hoists positioned along the entire supporting beam. 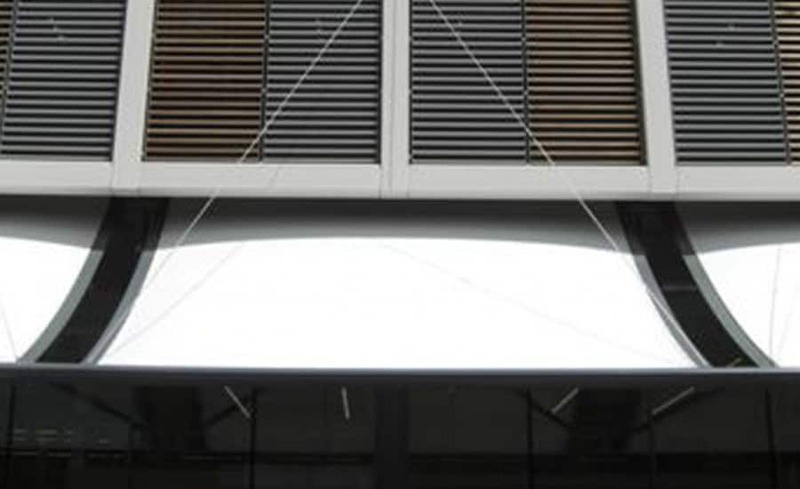 Using an experienced team of fabric installers, the canopy was installed quickly and with few complications. Everyone was delighted with the finished result which was completed ahead of program and within budget.